EDF has decided to group together its hydraulics-related activities by creating a single hub in the Parc d’Oxford development zone. The site, next to the N481 main road, offers EDF a stunning showcase at the entrance to the town. The Hydraulics Centre has a two-storey concrete base with a pattern of vertical stripes. 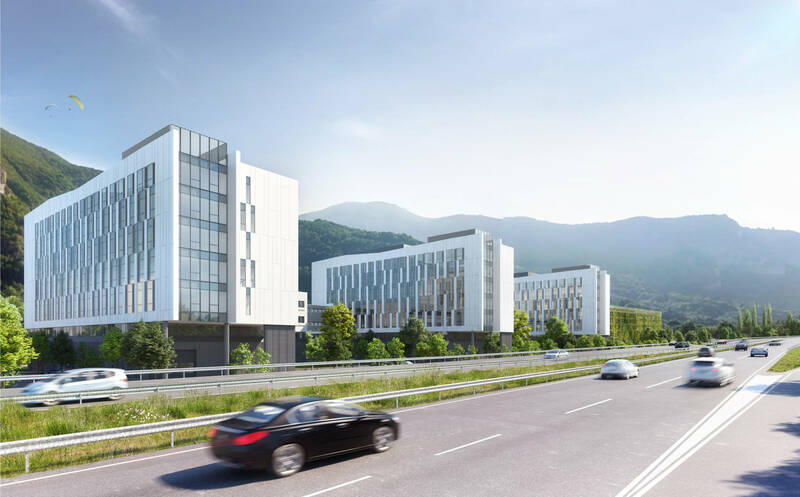 Three perpendicular 6-storey blocks have eye-catching slender vertical white concrete slabs framing glazed sections at one end overlooking the valley. These three vertical blocks are connected to the three-storey buildings below. Awarded BREEAM certification, the complex aims to achieve a high level of environmental performance: it features energy-efficient systems and a sophisticated BMS, thermally active floors, planted terraces, and interior gardens that will retain water in case of unusually heavy rain. Tertiary hydraulics centre covering 20,700 square metres, 3,000 square metres of specific facilities (IT labs, control centre, etc.) and 2,600 square metres of machine rooms ; a training centre covering 3,800 square metres, a staff canteen (1,600 square metres) and a multi-storey car park for 520 cars (plus 250 ground level parking spaces). A hotel with 120 rooms, and its conservation area.